© Judd Patterson 2008. Click to enlarge image. campaigned to have the lightning bug named Pennsylvania’s state insect in 1974. No longer a child myself, nevertheless, my backyard seems an enchanted place on summer evenings, with spots of light flashing from the ground to the treetops. Lightning bug in Barb’s yard. July 9, 2013. © Barb Elliot. Click to enlarge. reproduce during that time. Scientists believe they eat pollen or nectar, though some may eat other small insects, or nothing at all. 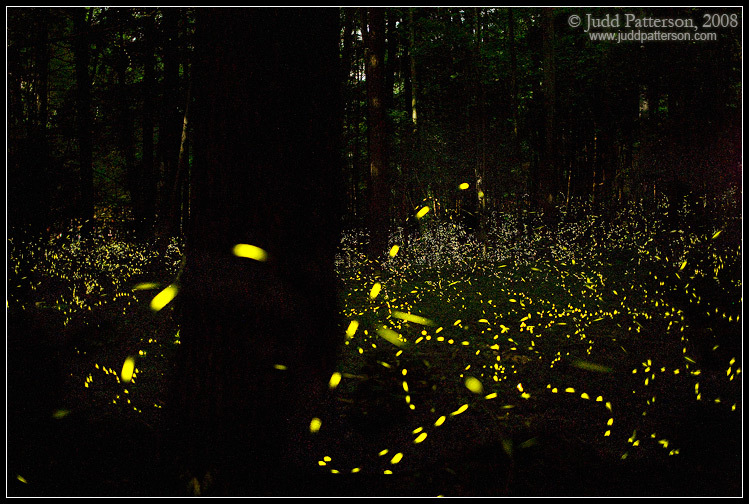 Their flashes are courtship communications that enable the fireflies to find mates of their own species. They are also a warning to potential predators like birds and spiders that firefly bodies contain toxic chemicals. Mating fireflies in Barb’s yard. July 11, 2013. Photo © Barb Elliot. Click to enlarge. Firefly larva holding & eating slug. Image by Phillip, Kalamazoo, MI. Click to enlarge. and easily digests the victim. In late fall, the larvae burrow under the bark of woody stems or into the soil, where they overwinter. Re-emerging in spring, they again feed on invertebrates for a few weeks. They then re-enter the soil, pupate, and in early to mid-summer emerge as adult fireflies. Intrigue and cunning among lightning bugs makes their world a dangerous place. Just as the sirens of Greek mythology lured sailors to their deaths, females of the genus Photuris mimic the flash of Photinus females in order to seduce Photinus males. 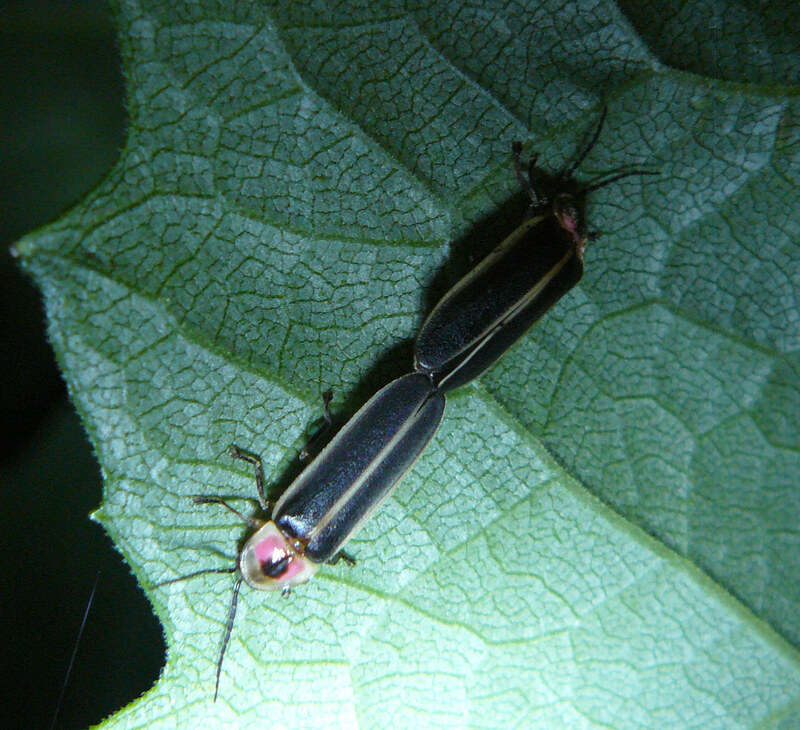 When they trick a Photinus male into coming to them, the Photuris female eats the male. She gains energy to produce better and more eggs and incorporates the male Photinus’s protective toxins. 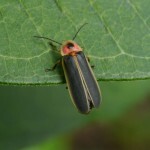 Common Eastern Firefly (Photinus pyralis). Photo by Terry Priest, 2009. Licensed under Creative Commons Share-alike. Click to enlarge. genes used for firefly’s light and use them to track, mark, and assist in the killing of human cancer cells. In fact, biochemical companies have commercially harvested lightning bugs for their luciferin and luciferase. Firefly populations are declining in the U.S. and in many parts of the world. Scientists are researching reasons for the decline of some populations. Certainly, a major threat is loss of habitat through development. 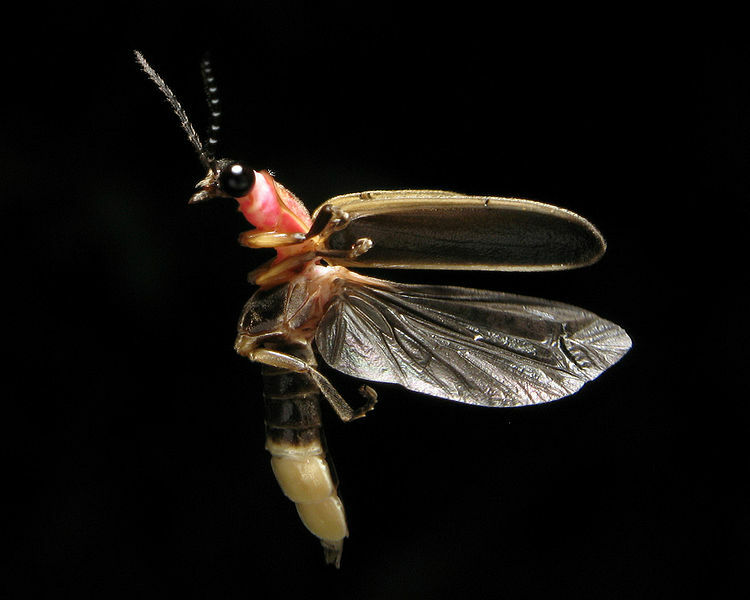 Fireflies tend to show site fidelity — with generation after generation finding mates, laying eggs, and emerging in the same location every year. When such sites are lost, we lose that group of fireflies forever. Eliminate the use of pesticides, including those intended to kill grubs in lawns. Don’t turn on outdoor lights at night. To mate and reproduce successfully, fireflies must be able to see the flashing of other fireflies. If you must use outdoor lighting, use motion-detector lights. 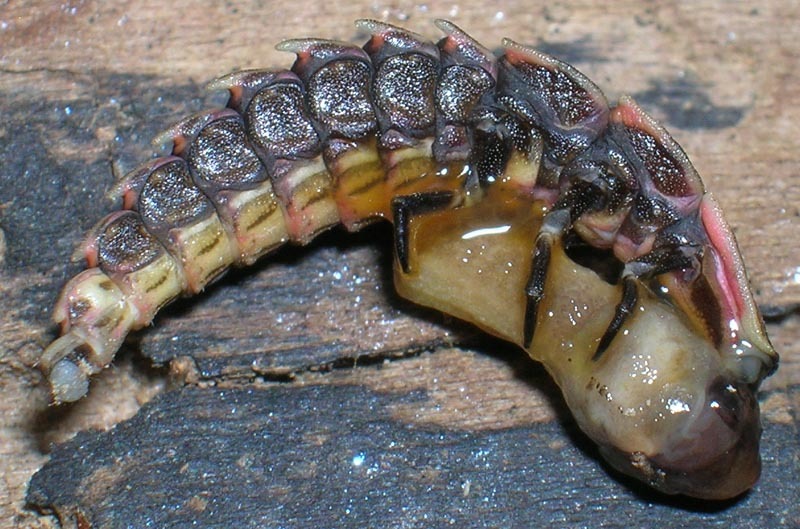 To create habitat for firefly larvae, place some logs on the ground and use leaf litter (chopped if you prefer) to mulch flower beds, trees, and shrubs. Plant trees. Native trees, especially evergreens such as White Pine (Pinus strobus) provide areas of low light and shade that give fireflies more time to find mates. Consider mowing your grass less frequently. Lightning bugs spend daylight hours on the ground and frequent mowing is likely harmful. Create a perennial bed or pocket meadow of densely planted native grasses and perennials. This will allow fireflies to hide during the day, while providing high vantage points for flashing at night. 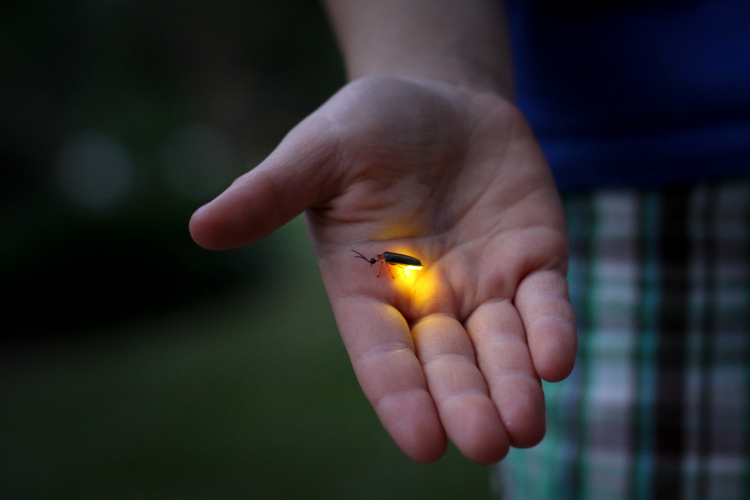 If your kids or grandkids catch fireflies, encourage them to handle them gently and release them after a few hours. They’ll be glad their fireflies can thrive and produce another generation. Last, since relatively little is known about this enchanting insect, consider taking part in the Firefly Watch citizen science project. Participation takes just 10 minutes of observation in your yard per week over the summer, and you’ll be joining citizen scientists in Canada and 40 U.S. states who are contributing data about their lightning bug sightings. 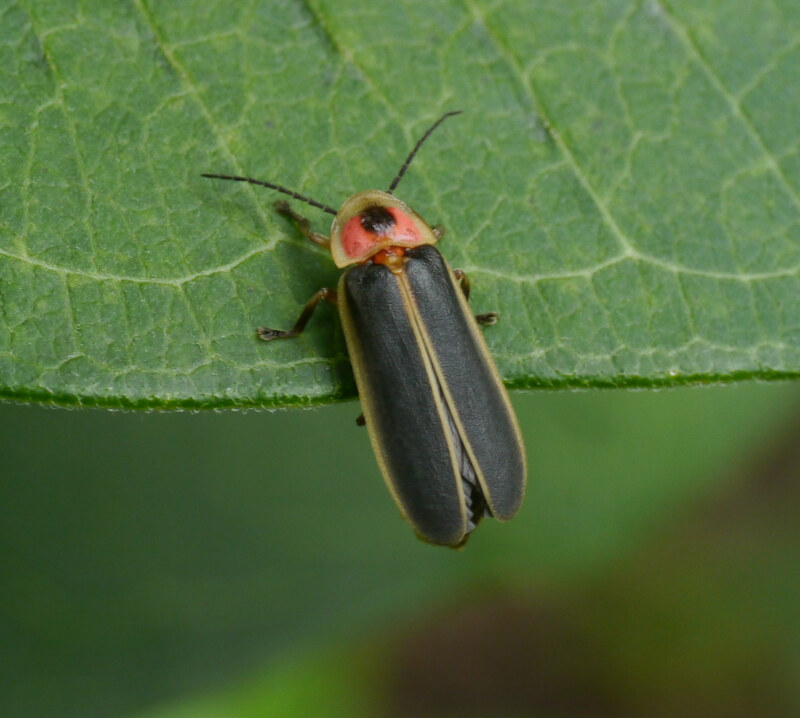 Let’s work together to keep our southeastern Pennsylvania lightning bug population healthy by providing the habitat they need in our neighborhoods. If we do, we will continue to enjoy the free light show each summer. Generations of kids to come will enjoy their magic. Photo by Jessica Lucia. Creative Commons License. Click to enlarge. 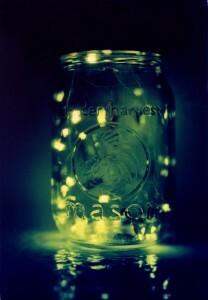 This entry was posted in Native Plants and tagged fireflies, glow worm, lightning bug by barb. Bookmark the permalink. I never realized there were different species of Fireflies in my yard! What a great article! Thanks, Sandra! Glad you enjoyed the article. Fireflies are so interesting. I learned a great deal that I hadn’t known about them through my research for the article. I will be visiting Pennsylvania with my family August 11-20, Will there still be lightning bugs to see? Victor, thanks for your question. I think that by August there will be fewer fireflies to see in Pennsylvania, but it may depend on where you are visiting in the state. I live in southeastern Pennsylvania and I honestly cannot remember if I see them here into August or not. Unfortunately, I haven’t kept records of my yard sightings, but your question may spur me to do so in the future. There is a map of firefly sightings by year and month that have been submitted by citizen scientists at the Museum of Science Firefly Watch website: https://legacy.mos.org/fireflywatch/view_and_explore_data. It indicates fewer sightings in Pennsylvania in August than in June and July, but fireflies are still seen in the state in August. I hope that you and your family enjoy your trip to Pennsylvania this August and that you are able to see and enjoy some of our fireflies in Pennsylvania.